Born in 1499 as Giovanni de'Medici, Pius was Pope from 1559 to 1565. 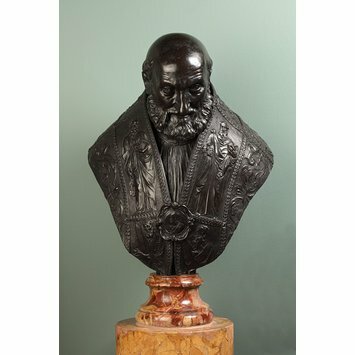 The bust is paired with one of Pope Sixtus V, and cannot therefore have been made before his accession in 1585, so that it must be posthumous. Both must have been made after the accession of Sixtus in 1585, and possibly still later. This bust together with A.40-1910 are probably from the same workshop. The head of Christ on the morse is related to a medallion by Leone Leoni. The pope is represented with head bowed, wearing a cope with representations of St. Peter, St. Paul, St. Andrew, and St. Simon. On the morse is a profile bust of Christ. Bequeathed by H.C. Wilkinson, Esq. Born in 1499 Pius was Pope from 1559 to 1565. 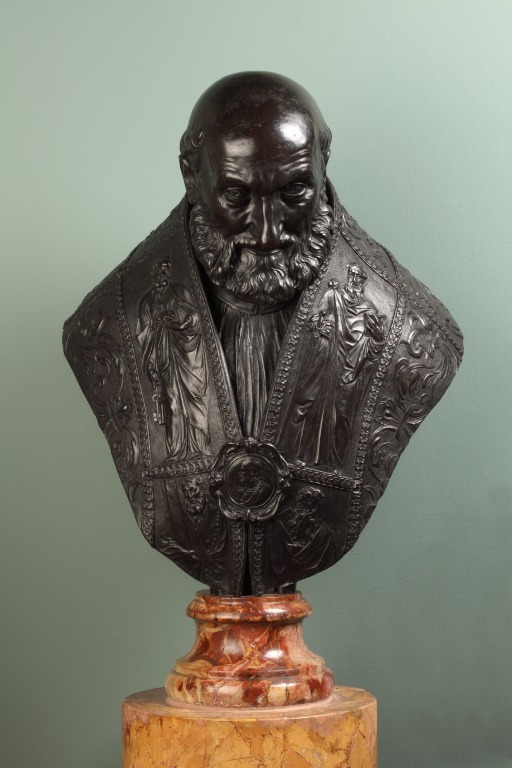 The bust is paired with one of Pope Sixtus V, and cannot therefore have been made before his accession in 1585, so that it must be posthumous. The head of Christ on the morse is related to a medallion by Leone Leoni.